This fun day event will take place on Saturday 31st March 2012 so that it is open to families as well. The sea birds are now coming back inshore onto the cliffs to start breeding, so there is lots of wildlife to spot during the Sea Safaris.The Grey Seals that travel along the beautiful Cornish Coastline are begining to come back into Newquay Harbour and the surrounding area. Have fun learning about these little characters and learn to spot males from females. If we are lucky we may be treated to a glimpse of a pod of Dolphins. Bottlenose Dolphins reguarly feed along Newquay Bay. Enjoy learning about the Commercial Crabbing Boats that work out of the harbour but best of all come and experience our superfast boat trip whilst donating to this wildlife Charity! Would -be Anglers learn the tricks of the trade from our friendly Cornish Skipper ,with your own rod and reel ,try to catch sustainably caught fish for "ee" suppers !!! 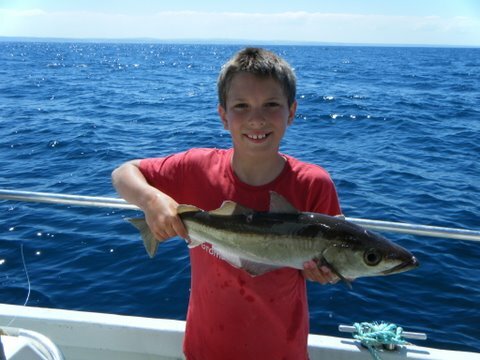 Recent catches include :Cod, Pollack, Red Gurnard, Ling, Conger Eel and many more.....hot drinks available and proper toilet on board for your comfort. Passengers are advised to arrive 15 minutes before the trip leaves to get parking space( available at Newquay harbour) and wear warm clothing as it is still early season.